The Russian government is focusing its economic policy on creating “clusters” of economic development. One of the proposed clusters is a tourism cluster incorporating the 20 towns surrounding Moscow known as the Golden Ring. For those whose experience of Russia is limited to Moscow and St. Petersburg, visiting the Golden Ring gives a completely new perspective on the country. Yury Bychkov coined the term “Golden Ring” in the 1960s while writing a series of articles for a Soviet newspaper. At first, the Ring consisted of eight ancient Russian cities to the east and northeast of Moscow that featured culturally and historically significant sights. Over time the Ring expanded, and now it encompasses 23 cities. In 2010, Ring cities were visited by 3 million tourists. The Golden Ring Development Corporation, which is spearheading the development of the cluster, estimates that 20 million people could potentially tour the cities every year. “The standard length of a tourist trip around Russia is about seven days; three of these are spent in Moscow and the Golden Ring cities, and the other four are spent in and around St. Petersburg,” said Ildar Musin, director of incoming and corporate tourism at Intourist. According to Musin, tourists either take day trips to individual Golden Ring cities or lose a day of their vacation travelling between them. There is little infrastructure in place for those who want more than one day to visit a city, and so developing hotels and recreation areas for tourists is one of the goals of the Golden Ring development cluster. Experts believe that more than 100 billion rubles will be needed to create the necessary infrastructure for the cluster’s development. The idea of a tourism cluster grew out of federal government plans in the mid-2000s to create technology clusters around Russia. Although federal support for technology clusters was suspended during the financial crisis, private investors and local authorities embraced the idea, and focusing a cluster around tourism rather than industry indicates that the idea has taken on a life of its own. So far, the plans for the Golden Ring cluster involve anointing one city a tourist hub that visitors could use as a base for exploring the rest of the region. One of the prime contenders is Yaroslavl. “It is our ambition to become the capital of the Golden Ring,” said Igor Elfimov, deputy governor of the Yaroslavl Region. According to Elfimov, an agreement already exists to build fast rail links between Moscow and Yaroslavl and to organize regular flights from both Moscow and St. Petersburg, likely on low-cost airlines and charters. The Golden Ring Development Corporation is already building a complex of nine hotels in the Yaroslavl Region, near the town of Pereslavl – Zalessky. However, infrastructure alone is not enough to attract visitors. Regional authorities must come up with new ways of selling the region to tourists. And they will have to start from the moment the guests arrive. At the moment, tourists in every attraction at every city in the region are greeted in the same way: They are given a traditional bread-and-salt welcome by middle-aged women in colorful national costume. Although the goal is to emphasize the traditional customs of Russia, by the third welcome ceremony, the novelty really starts to wear off. Only one local attraction deviates from this tradition—the vodka museum in the town of Uglich. At this site, which ironically is located in the town’s former drunk tank, tourists are welcomed with an undiluted drink of forty percent proof, and then a slightly weaker brew made from prunes; visitors can also line their stomachs with salted cucumber, another traditional Russian delicacy. Next door is a museum of prison art, where visitors can see the handiwork of criminals living out their sentence in nearby prisons. The administration of the small town of Myshkin (mouse village) have played off the town’s name and created an entire complex called “The Mouse Kingdom.” This initiative has helped to attract tourists and has given them to opportunity to produce and sell related memorabilia. 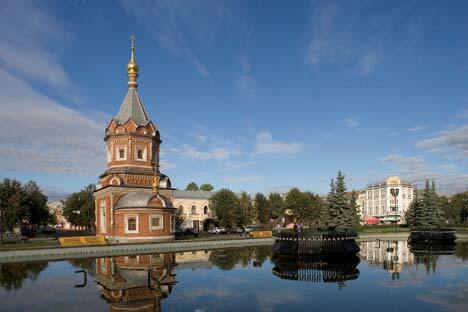 For their part, the Yaroslavl authorities are hoping to attract tourists from Asia. One example, “Red Tourism,” is aimed at Chinese tourists and allows visitors to run a collective farm. By banding together into a cluster, the Golden Ring cities can work together to promote tourism to the region as a whole. Then they can avoid competing with each other for the same tourists – doing battle with bread and salt – and instead focus on developing the unique character of each destination.